Pittsburgh Steelers safety Sean Davis said he was fined for his helmet-to-helmet hit to Chiefs wideout Chris Conley, but Davis contends he did nothing wrong on the play that resulted in an unnecessary roughness penalty Sunday. 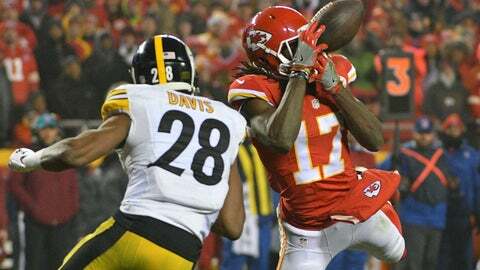 Davis, who said he was fined $24,000 for the hit but plans to appeal it, said he was basically in a no-win situation during the play that set up the Chiefs’ second touchdown late in the fourth quarter of the Steelers’ 18-16 win. “I couldn’t have done anything different, especially in the red zone. I’m forced to tackle high. If I tackle low, there’s a chance of him falling on top of me into the end zone,” he said.